“What the hell happened to you?” Captain Cyrus Drake asked as Taraka and Gaster walked up the cargo ramp along with the former’s Tangrowth, who was carrying the unconscious bodies of Axel and Dane Lory in her vine arms. “So we finally bagged Dane Lory, huh?” Cyrus asked, eying the mercenary. “It’s a shame we don’t have the time to properly deal with this,” the Maverick’s captain continued. “Why not?” Gaster asked, raising an eyebrow. “What happened now?” Ever since he had been picked up by the Maverick, it had seemed to the former smuggler that one thing just kept happening after another. Life certainly wasn’t boring aboard this ship. After seeing their injured crewmate to the medbay and tying up their prisoner in the cargo hold, Gaster and Taraka headed to the front of the ship. When they arrived, they found Cyrus and Anya waiting for them. “Alright, what’s all the fuss about?” Gaster said, looking back and forth between the two of them. “Hold on, did you say Markovic?” Gaster interrupted, suddenly feeling anger swelling inside. Markovic was a name the former smuggler was all too familiar with. “I take it you’ve heard the name before?” Cyrus asked. “Wait, who is this Markovic guy, exactly?” Taraka asked. “Sounds like a bad dude,” Taraka said. “What the hell are we gonna do with that Dane Lory guy?” Gaster asked. “Like I said, we don’t have the time to properly deal with him,” the captain replied. Gaster gazed out the front viewport from one of the back seats in the cockpit as the Maverick dropped out of warp space at the Sector 34 warp gate. The ship had just jumped across the sector from Araimia and would soon be on its way to Sector 20 near Romanov space. As he looked out into the vacuum of space, Gaster’s attention was pulled back inside by a flashing light on the console. “Is there a message?” Cyrus asked. “Can you hail them?” Gaster asked, looking on over Anya’s shoulder. “I can try, but I doubt anyone will respond.” The pilot sent out the call, but there was no response. “Looks like you were right,” Gaster said. “Take us in,” Cyrus said. “Got it, boss,” Anya replied. With a slight nudge of the controls, she steered the Maverick toward the mystery ship. As they got close, Gaster could see the ship come into view. It was a small Alliance-make bucket that looked like it had seen better days, simply drifting along with no power. “You think anyone’s alive in there?” the former smuggler asked, looking over at his crewmates. “Right,” Gaster said, following behind his employer. The two headed for the airlock, where they were joined by Ace and Taraka. Taking point as they headed through the airlock, Ace approached the shut door on the other side. “I don’t think I can access the door systems without power,” the android said after checking the door. “Do you think we can power it up by shooting it with electricity?” Taraka suggested. “Worth a shot,” Cyrus said. Heeding her trainer’s command, the Zebstrika shot off a bolt of electricity. Sparks flew everywhere as it hit, and the door slid open, revealing a dark corridor on the other side. “Looks like nobody’s home,” Ace said as he peered through the airlock into the dark ship. “The emergency power’s on, so there’s a chance we may find someone yet,” Cyrus said, noting the active gravity and life support systems as he stepped aboard. Moving down the corridor from the airlock with Taraka’s Zebstrika lighting the way, the Maverick crew soon arrived at a fork. A door lay dead ahead, while corridors branched off to the left and the right, each leading to another door. “Which way sh0uld we go?” Ace asked, looking down the two corridors. Suddenly, Gaster heard a light thud on the other side of the door right in front of them. “Definitely that way,” the former smuggler said, motioning at the door. Moving as silently as he could, Taraka approached the door and touched the console. Nothing happened, of course, because there was no power. “You’re up again, Blitz,” the monk then said, looking back at his Zebstrika. 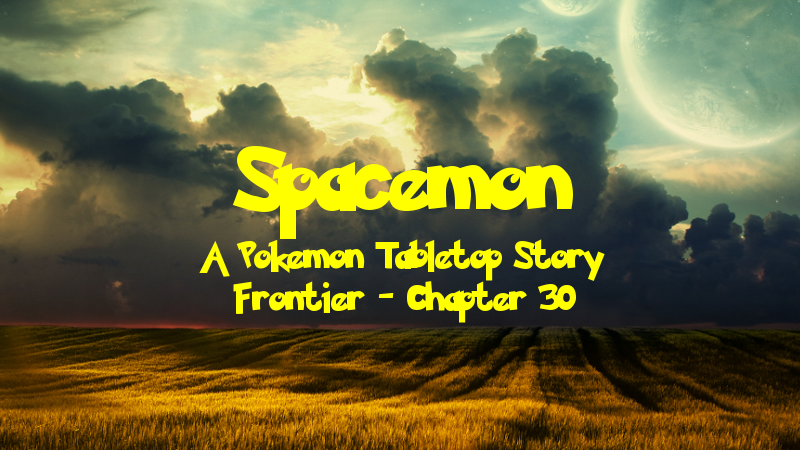 His Pokemon fired off another bolt of electricity, but this time they weren’t as lucky. The console exploded as the sudden jolt shorted out its circuits. “Maybe we can melt our way through,” Gaster suggested. He reached for his Quilava’s Pokeball and sent him out. “Rusty, melt your way through this door,” he commanded the Pokemon, pointing at the obstacle blocking their path. Rust began spewing out flames from his mouth, and the door slowly began to glow red hot as the metal warped and melted. This went on for several minutes before the Quilava stopped. Rusty was clearly running out of juice and they seemed no closer to getting through. “This is going to take too long,” Cyrus said. A sudden creaking noise cut the former smuggler off as the door began to slide open. It struggled for a moment due to its partially melted state, but it eventually managed to open. “Hey, it looks like the fire worked,” Taraka said. “Sure, whatever captain,” Taraka said before striding through the doorway. Gaster looked at Cyrus and shrugged, then followed the monk inside. He scanned the room with his rifle, but it was too dark to really see anything clearly. “Hey is there anyone alive in here?” Taraka called out. “Yes,” a woman’s voice answered. Looking in the direction it came from, Gaster saw a young woman who looked to be in her twenties stepping out from the shadows. Her blonde hair was pulled back into a tight bun except for her bangs hanging loosely into her face, and she was garbed in a set of light tactical armor. She also had a pistol drawn, although she held it in a non-threatening way. It was clear to Gaster that she just wanted them to know she was armed. He couldn’t blame her, of course. “Are you friendly?” the woman asked, her tone defensive, but not aggressive. “We’re not here to kill you unless you’re going to try to kill us, I can promise you that,” Gaster answered. “Nope, not gonna do that,” the woman replied, lowering her pistol. “Well, if you’re not gonna kill us, then I don’t see why we can’t lend a hand,” Gaster said, a half-smile on his face. “Just so we’re clear, I’m not the one who burned the door,” Taraka said. “This is why we can’t have nice things,” Cyrus said, walking into the room. “We noticed,” Gaster said as he glanced around the room once more. “So you’re the only one on this ship?” he asked, turning back to the young woman. “You don’t look like a murderer, so I think we can find some room on our ship,” Cyrus said. “Cyrus. Captain Cyrus Drake,” the captain said, holding out his hand to the woman. “And these three are Ace, Gaster, and Taraka,” he continued, motioning at the three members of his crew with his other hand. “Nice to meet you, Captain Drake,” she replied, giving his hand a shake. “Welcome aboard the UAS Maverick,” Captain Cyrus Drake said as he stepped back onto his ship. “It is a very nice ship,” Kasey said. “It’s a bit crowded, though,” Gaster said as he and Taraka pushed a crate full of salvaged materials through the airlock. It was loaded up with an advanced, if a bit beat up, shield core — the one component of Kasey’s ship that was still in decent condition — as well as several thousand credits worth of scrap materials the crew had managed to recover. “Wait, what now?” the pilot’s voice sounded. Cyrus looked over to see Anya entering the corridor from the living quarters. “Hey, what’s that supposed to mean?” Taraka teased. “Nice to meet you, Anya,” Kasey said, letting out a laugh. “So is this your whole crew?” she then asked, turning back to Cyrus. “There’s also Axel, my hired muscle, who’s currently knocked out, and Erik, our engineer, who we’ll have take a look at this fancy new shield core you’ve given us, and then there’s Ace, who you’ve already met. Ah, here he is now.” The captain motioned at the disguised android as he brought the last crate of salvage through the airlock. “Wait, what?” Gaster asked. He sounded dumbstruck, as anyone most certainly would be in his situation. The crew hadn’t yet shareed Ace’s secret with the former smuggler. “Oh, sorry, was that supposed to be a secret?” Kasey asked. “You know how to use that, then?” Cyrus asked, eyeing the pistol holstered at Kasey’s side. Notes: Well this was a fun little chapter. The opening was the last few minutes of the previous session, which I decided to move to this chapter because I thought everything would flow better. It was mostly in the session just to tease the plot I had prepared for the following session. We rehashed it a little bit at the start of the next session because we wanted to wait for Axel before deciding what to do with Lory, but he ended up needing to miss another one, so I left the choice up to Novi and unknown. So, Markovic was a Romanov gangster character I came up with that I wanted to use in the campaign as one of the many plot arcs and at some point before introducing him I decided to tie him to Anya’s backstory to give her some more depth, and then when unknown joined the campaign and pitched Gaster as a character I realized it worked out perfectly for Markovic to be tied to his backstory as well. Anyway, onto the real substance of this chapter. Aside from the opening scene, everything is from the first part of session 24. As we had lost Roland’s player and Axel’s schedule was becoming a bit iffier, I decided to bring on a fourth player. Kasey is played by my buddy Alec, who conveniently uses his name as his online handle. He was just getting into tabletop at the time and wanted to join my campaign. I helped him come up with a character since he was very new to the system, and he decided to try out running a female character to get better at roleplaying. He sort of joined in last moment so I kind of had to shoehorn Kasey’s introduction into the beginning of the session as I had already set up a session plan before he joined. Post-Chapter Challenge: So, now you’ve met all the player characters in Frontier. We’ve only just learned a little bit about her here, and there’s still some mystery about her. She has special forces training, and she’s a scientist specializing in robotics, and I will tell you that her backstory is connected to the plot somehow. Since I’m feeling terribly uninspired in coming up with a challenge for this chapter, how about you come up with some theories about Kasey? Who do you think she is, and how do you think she’s related to the plot?